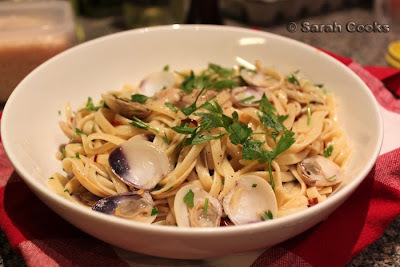 Sarah Cooks: Linguine alle vongole or "Perfection in a bowl"
Linguine alle vongole or "Perfection in a bowl"
Linguine alle vongole is one of my favourite suppers, which I first made in 2005 during my How to Eat Project, and I don't cook it nearly as often as I'd like. Despite it taking a grand total of 15 minutes to make, I don't have a nearby supplier of fresh clams. But, last Saturday I had a nice outing to the market, and thought I'd pick up a small amount of clams for my dinner. 150g was about $4, which seems expensive, but considering all the other ingredients are so cheap, it turned out to be a tidy little dinner. So, here's how you make it. 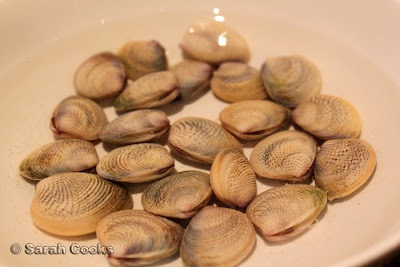 Soak 200g of clams in a bowl of cold fresh water. Put a pot of water on to boil for the pasta. When the water comes to the boil, add salt and 100g of linguine. Nigella suggests 150g, but I feel that is too much for one person. Cook for the length of time specified on the packet. This is usually about 12 minutes, which gives you just enough time to prepare the rest of the dish. 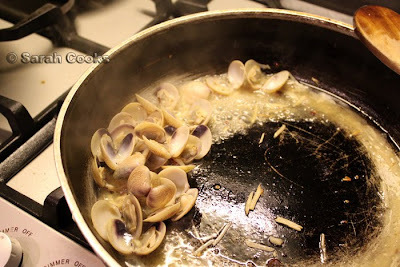 If the pasta is cooked before the clams are ready, just drain it and pour over a little olive oil to prevent it from sticking. 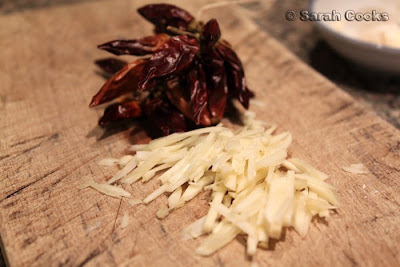 Meanwhile, slice up 1 clove of garlic and crush a dried red chilli. Add the garlic and 2 tbs olive oil to a pan, and cook on a low heat until softened. (Don't let the garlic burn). Add the crushed dried chilli and cook for another minute. Drain the clams, giving them a rinse to get rid of any excess grit. Turn up the pan to medium-high and tip the clams into the pan. Pour in 80 ml of white wine, which should bubble up vociferously. 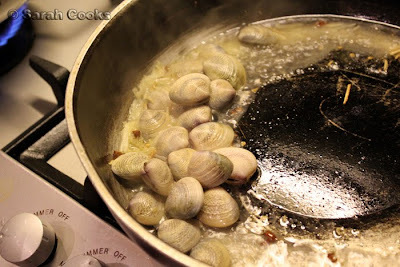 Clamp on a lid and let the clams cook for 2 - 3 minutes, or until they all open up. Give the pan a shake every now and then to help the heat distribute evenly. You will have to throw away any that refuse to open up. Turn off the heat and tip the pasta into the pan, giving it a good stir to mix the clams through evenly, and to make sure all the pasta is coated with the sauce. Add a small sprinkling of chopped parsley, give it another stir, and you are done! There is no need to add cheese (heaven forbid! ), and I find it salty enough without adding salt, but taste and see how you go. It is hard to describe how simple and delicious this meal is. Even though I reduce the amount of pasta from Nigella's recipe, I leave other quantities unchanged, as I just love the salty garlic liquid. There is something about the briney clam liquid, combined with the garlic, chilli and fresh parsley that is just wonderful. 3rd reference to vongole I have spotted in a week. I really want to make a batch now. This is a deliciously simple recipe that never fails to satisfy. Thanks. This looks really nice. I heart little clams in pasta. Yum, We love clams and this looks like a great way to do them. Now, you donl;t have an "Ask Sarah" section so I'm ging to gatecrash: what are finger limes used for? There was a big basket of them at Prahran Market last week and I badly wanted to buy some, but had no reason. Looks good,looks like comfort, gotta love the pasta! Lovin the clams! I'm actually havin linguine right now- but yours looks better. I do like this dish very much as well. And it is a pity that it is hard to find fresh clams here. Maybe try Footscray. looks awesome sarah! damn why am i reading this post jog and pre dinner??!! starving now LOL! can i get fresh clams at the vic market? This is one of my ab-faves, too. I like it w/canned clams, as well, and do believe there's a recipe in HTE involving garlic & parsley (yeah? )...but you'd remember better than me. i love all your cooking posts - this recipe looks stunning! Berlin Bar & Ling Nam or "Why I love Melbourne"